Welcome to SportsNation on ESPN Radio! 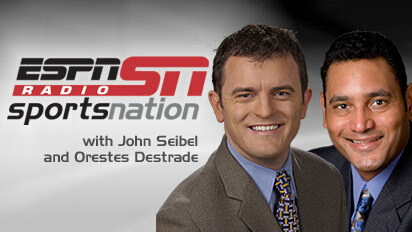 John Seibel and Orestes Destrade will be coming to you Monday-Friday from 4-6:30 p.m. ET as hosts of ESPN Radio SportsNation, a show specially designed for you! Before the show, each day at 2 p.m. ET, you can join the ESPN Radio SportsNation chat and let the duo know what is on your mind. What do you want the show to be? Which stories are the hottest? What is your take on those stories? Be a part of the show and chat with John and Orestes each day at 2 p.m. ET!